Artist. Not just a quilt artist. I remember my purple bedroom with the hollowed-out-closet turned art studio. It was AWESOME! At five, this was waaaay better than a trip to Disney. I sat in there for hours at my little desk coloring, drawing, stamping, creating. I had to get permission for messy stuff like glue, paint, and clay but my parents made sure that I got to use them sometimes too. My husband and I are getting an art studio ready for me in this house. It’s a bedroom that was a storage room. The things that were in there have sorted, organized, and put in their proper places so now it’s empty and ready for sprucing up. 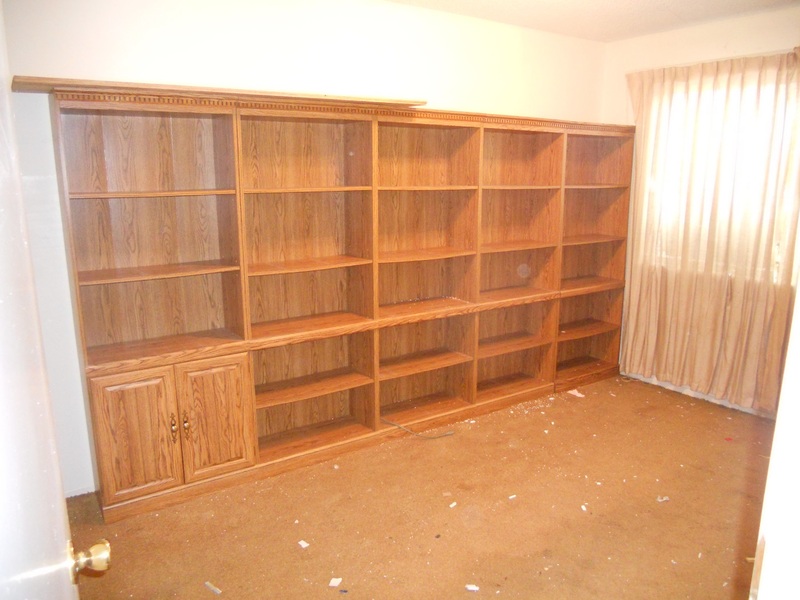 Yes, the row of shelving stays. I get to fill it up with fabric! 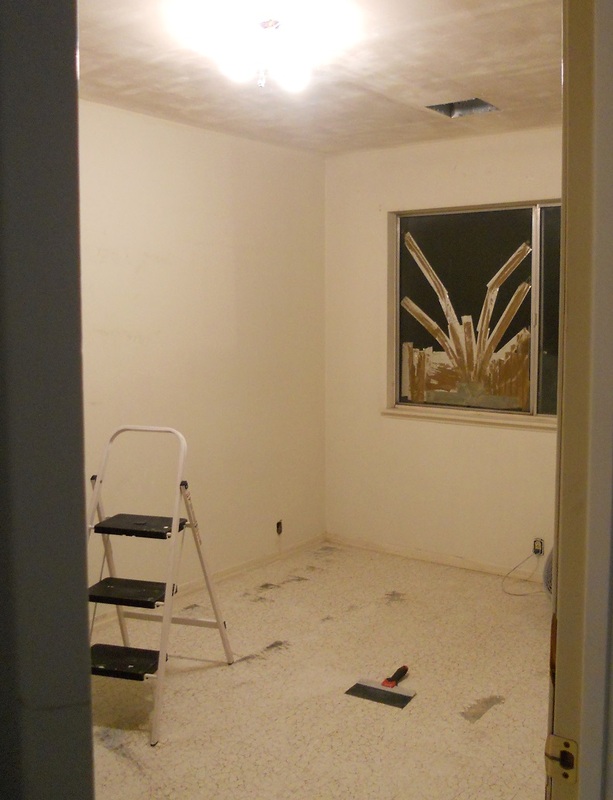 We got rid of the smelly carpet, threadbare curtains, and popcorn ceiling treatment. The weird shape on the window is from the brown packaging tape holding it together. It’ll need to be replaced. We got rid of the 7The first things accomplished getting rid of the carpet, tossing the curtains, and scraping the popcorn treatment off the ceiling. I had a circus party in the closet studio house. The invitations were tickets I made. I painted our windows (half dish soap, and half paint) with balloons, clowns, and animals. We made a train down to the basement playroom. Hands on the shoulders of the kid in front of you. No pushing! There was a face-painting station and a cake with a train on it. Such fun! At 31, I can still taste being five years old. So I’ve decided to play! 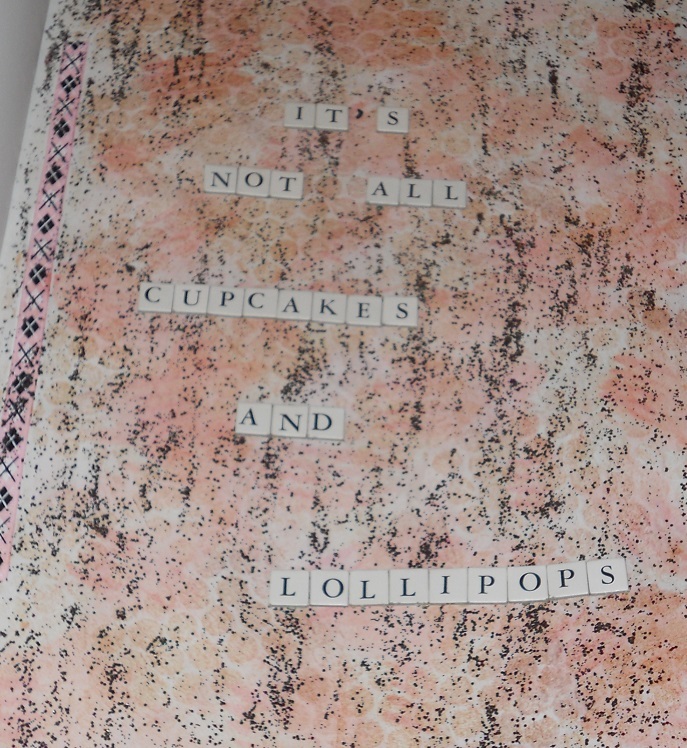 I’m joining a meet-up for art journalling in my area. My first meeting is this Friday morning. I’m hoping to make friends and to play. Not to make anything specific or become a world-famous collage maker or painter, but to play with other artists. Linking up to Val’s sewing room link party. Check it out if you want some ideas for your studio. This entry was posted in Art, Artist's Studio, Collaborations, Family, Journaling and tagged art journal, art studio, artist, artist friends, bedroom to studio, birthday, birthday party, broken window, circus birthday party, closet art studio, DIY, drawing, house, how five felt, kids crafts, learning to paint, making do, meet-up, new studio, painting, playing, quilting, quilting studio, removing carpet, removing popcorn ceilings, renovating a room, unusual materials, wall of shelves on February 24, 2015 by quiltartbymegan. In the summer of 1991, my mom used my love of art to encourage me to practice reading. I got to draw a picture of my favorite part of the book as I finished each one. I drew these pictures with fabric crayons on muslin fabric. By the end of that summer, I was begging to go to the library and check out more books. Here’s the thing. This quilt that I treasure so so much was made before Mom learned to quilt. It’s made with the cheapest fabrics available, lumpy polyester batting (which has only degraded with age) and is held together with… tied yarn in four places. Obviously her craft improved greatly with her later quilts. This one is literally coming apart at the seams. This one is such a treasure to me that I’m going to restore it. The photo above is the “before” picture. I will carefully cut out each square, add some stabilizer to the flimsy muslin, and border each block in a similar manner as the original quilt, with higher quality cottons. I plan to use calicoes, which were the choice of quilters at that time. It’ll get new batting and backing, and be quilted lovingly in her memory. Of course, my drawings are cute… but one of the things I love most about this quilt, now that my Mom has passed, is that the titles of every book are written on the blocks… in her handwriting. It’s interesting what’s comforting when a loved one has died. Handwriting is one of those things for me, and the love that’s obvious in this project. I’ll share with you guys the progress I make on this as I make it. This quilt has been folded up in a box for too long. 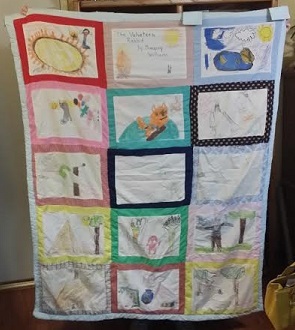 This entry was posted in Artist's Studio, Collaborations, UFOs and tagged childrens, drawing, Drawing on Fabric, Family, first quilts, learning to read, mom, Reading Quilt, Restoring on March 11, 2014 by quiltartbymegan. The turtles have arrived! And they’re so darned cute I’ve got to share some photos with you all. The first is of the blocks in one layout option. They haven’t been sewn together yet and may not stay in this arrangement, but it’ll give you an idea of what we’ve got. I’ll be adding a few small turtle blocks and a border or two to expand it into the size it needs to be. 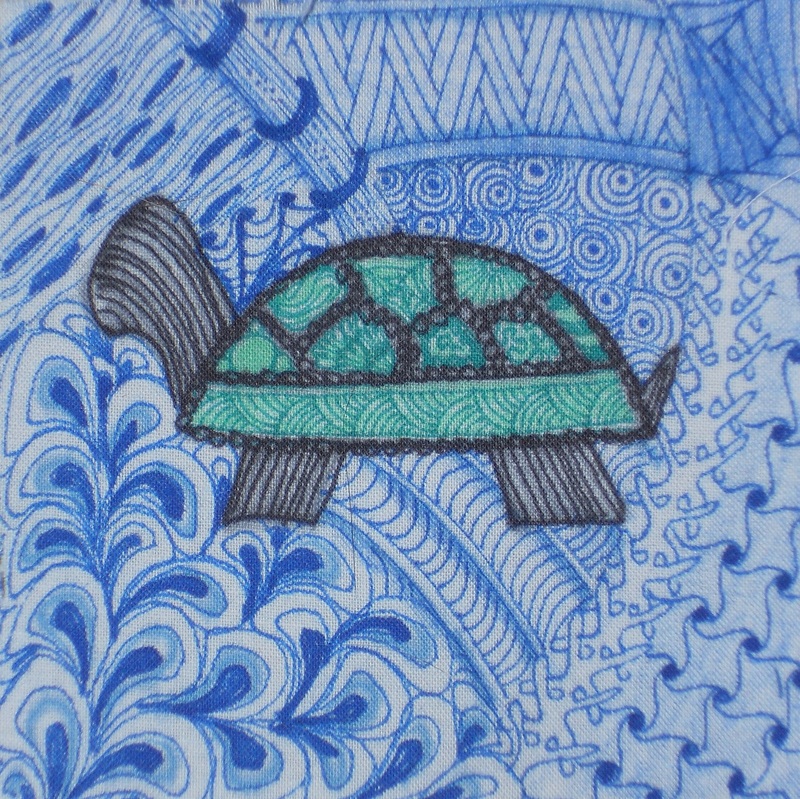 There’s a great variety of artists and methods used to create these turtles. Here’s one that’s appliqued and embroidered. 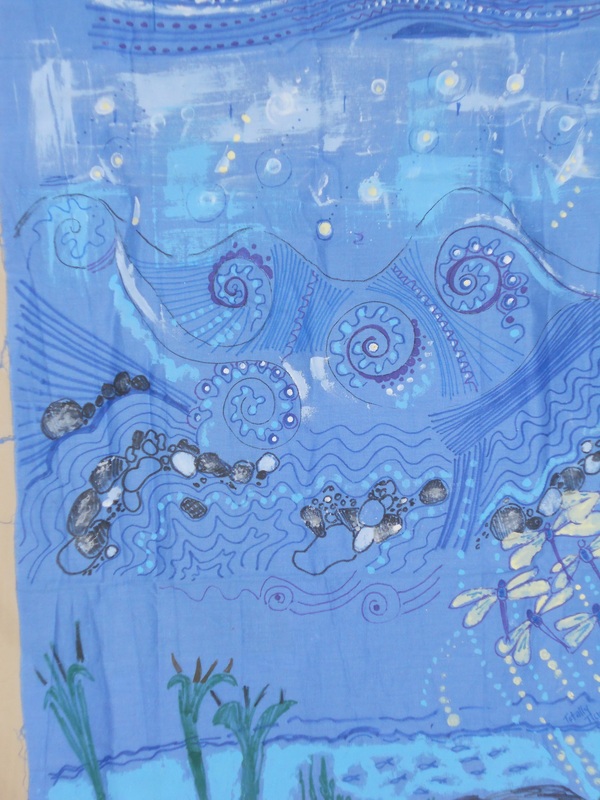 This gorgeous scene is painted onto the fabric. The last block I’m showing you today is drawn. Look at all the textures the marker lines create! I’ll post more updates as I go on this quilt as well as the turkeys’ two quilts. 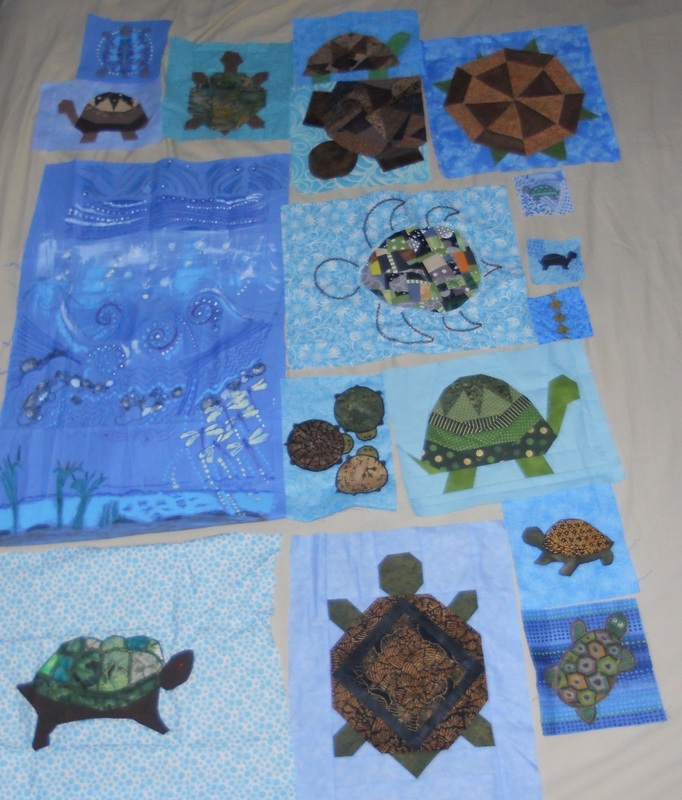 For more on the quilts I’m helping with for my childhood summer camp, check out these posts. This entry was posted in Art, Collaborations and tagged bears, clc, crystal lake camps, drawing, embroidery, fabric painting, lodge, quilter, quilting, quilts, summer camp, theme quilts, turkeys, turtle quilt, turtles, turtles quilt, wolves, zentangle on December 20, 2013 by quiltartbymegan.